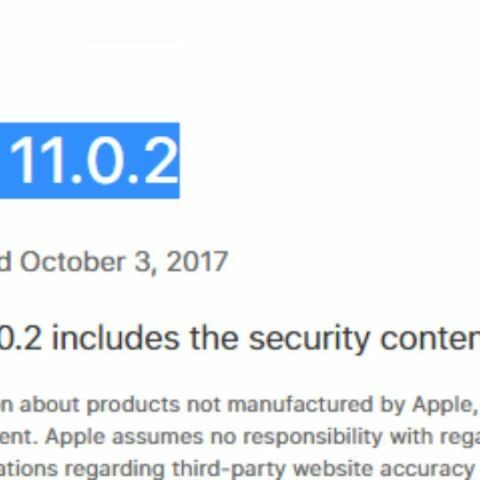 iOS 11.0.2 is the second official update to iOS 11 since it was made publicly available on September 19. Apple is rolling out the update in phases. Apple has released the second update to iOS 11 since the software was made public for all iPhone and iPad users on September 19. The latest iOS 11.0.2 OTA update brings with it a fix for the iPhone 8 crackling sound issue. Apple iPhone 8 and iPhone 8 Plus owners have been reporting of a strange crackling sound while making phone calls or FaceTime calls. Apple had acknowledged the problem and had promised a fix through a software upgrade. iOS 11.0.2 is that update and is available to download on iPhone 5s and later, iPad Air and later, and iPod touch 6th generation. However, users whould note that the update is rolling out in phases and might not be available to download on all devices for now. It usually takes a day or so for iOS updates to arrive on all devices after Apple starts rolling them out. Along with fixing the iPhone crackling sound issue, the second iOS 11 update also addresses an issue that could cause some photos to become hidden and Fixes an issue where attachments in S/MIME encrypted emails would not open. Last week, Apple has released the first update to iOS 11, fixing a critical Outlook and Exchange email issue. Some users had reported that they were not being able to send emails using any Microsoft account of their iOS devices. The problem was fixed by Apple with the iOS 11.0.1 update. To update to iOS 11.0.2, ensure your device is connected to Wi-Fi and a power outlet for charging. Tap Settings > General > Software Update. Tap Download and Install to get the update. If a message asks to temporarily remove apps because iOS needs more space for the update, tap Continue or Cancel. Later, iOS will reinstall apps that it removed.